It may be amazing to some historians of the music of the 1950s, but the Southlanders' most memorable recording is now undoubtedly, "The Mole In A Hole". Still much beloved even by the children of today, it was happily played along with the most groundbreaking rock 'n' roll when it first appeared in 1958. Perhaps music was not the serious business it appears to have become today! Brought together in London by Jamaican, Vernon Nesbeth, they originally called themselves the Caribbeans- presumably because all the members had West Indian backgrounds. 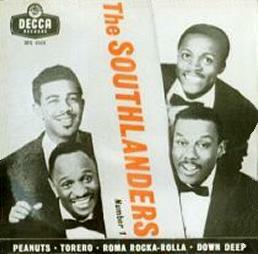 However, they soon changed their name to the Southlanders which was, arguably, much better suited to their music. Their style owed much more to American 'doo-wop' than to 'Calypso' which was the predominant West Indian fashion at the time. Indeed, their first release for EMI was a cover of what would become regarded as one of doo-wop's great classics. Although the flipside of this initial offering also appears to be American- ragtime, it is in fact the composition of German pianist Fritz Schulz-Reichel ! 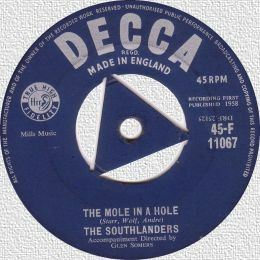 The EP on the left (Decca DFE6508) is entitled 'The Southlanders Number One' and was released in 1958. Sadly, I am unaware of the existence of a 'Number Two' and I think this difficult to find item is their only UK release on that format available from the 1950s or 1960s. Perhaps surprisingly, the Southlanders only managed the chart on one occasion- and they had to share its success with several other covers of the same song as well as the original. However, they managed to carve out a very substantial niche as cabaret performers and despite the demise of all the original members apart from Nesbeth, the Southlanders can usually still be found singing about that Mole somewhere. In fact Harry Wilmot died while the group were still in its heyday during 1961, but perhaps his music somehow lives on through his more famous son, Gary Wilmot, who was only six at the time of his father's death.